*Please take a moment to check out our current giveaways! Over the years I've come to realize that people either love beans or hate beans. There's no in between. Our family lands in the love category. When I invite people to my home for a meal, I need to remember to ask if everyone likes beans since I seem to add them to so many dishes! 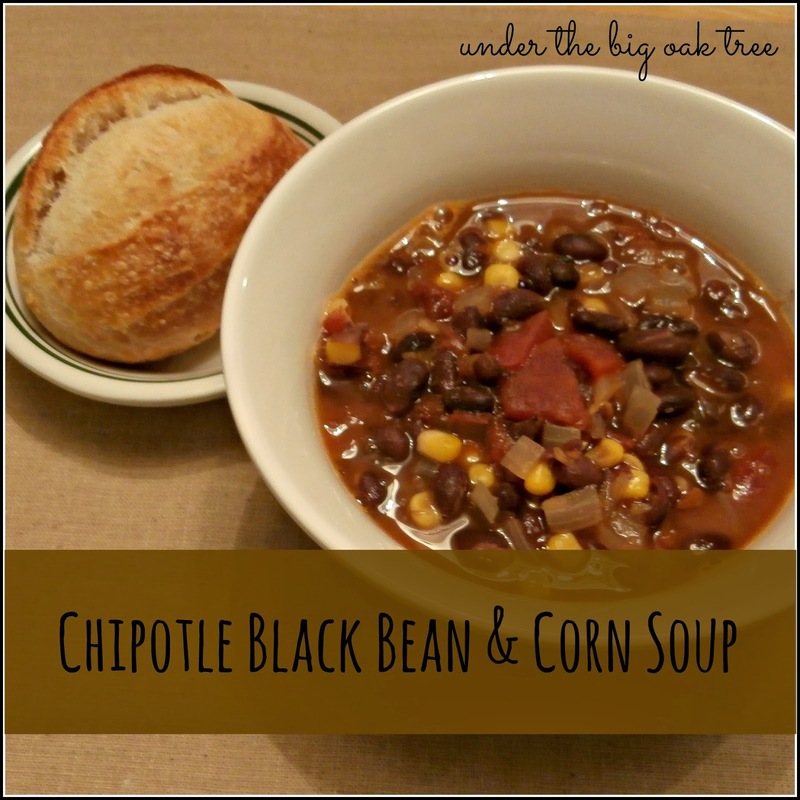 Black bean soup is a favorite but it's one I don't prepare at home very often. Until recently, that is! We liked this recipe so much, I've made it twice already! It's a frugal and pantry friendly recipe that is so quick and easy to prepare it's perfect for those nights you need to get something on the table quickly. In a soup pot or dutch oven, cook onion in hot oil. When the onion is starting to turn translucent, add the garlic powder, cumin and diced chipotles. Continue cooking for another minute or two. Stirring frequently. Stir in the tomatoes, adobo, and chicken broth. Bring to a boil, reduce heat and cover. Simmer for 10 minutes. In a bowl, mash 1/2 of the beans with a potato masher. Add all of the beans and the corn to the pot, stir and allow to cook for another 10-15 minutes or until heated through. I made this twice so far. Once using regular ground cumin from the jar. The second time I made this, I was out of cumin. Rummaging in my pantry, I found a bottle of cumin seeds. I measured out 2 tsp. and used my mortar and pestle to roughly grind them. I found the flavor more intense when we used the seeds that I ground myself. The corn in this recipe is completely optional. I like black bean and corn dip, so I decided to add just a little to my soup. I LOVE BEANs. and I'm dismayed, because my kids hate them and I'm not sure that's ever going to change! Grr. This recipe will go right next to my Olive Garden Pasta e' Fagioli copy-cat recipe! I love bean soups! Corn - heck yeah! Thanks for the recipe!